ABOVE: An Arlanda Express train in downtown Stockholm. INSET BELOW: A ticket machine in the Arlanda Express terminal. The fastest, most comfortable way to travel from the airport to the city is on the Arlanda Express train. Trains run every 15 minutes from morning through late evening, and even more often during the morning rush hours. The modern, luxurious trains are easy to get on and off (the floors are at platform level), and they have space for storing luggage and bicycles inside. 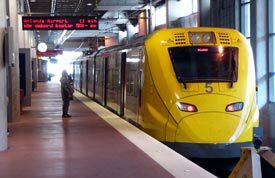 They're also fast, averaging 200 km/h (125 mph) for most of the 20-minute journey between the airport and the city. The downtown Arlanda Express terminal is next to the central railroad station and the T-Centralen Tunnelbana or subway stop. For train schedules and other information (including seasonal ticket bargains), visit the Arlanda Express Web site. Tip: The Arlanda Express stops at both of the airport's terminals. Monitors by the downtown train platforms show which terminals are used by different airlines, but in some cases, an airline may use one terminal for overseas flights and another for intra-European flights. To avoid unnecessary walking, check the terminal assignment with your airline or consult the Arlanda Airport Web site before leaving your hotel. A cheaper but slower transportation option is the airport bus from Arlanda to the Cityterminalen next to Stockholm's central railroad station and the T-Centralen underground stop. The company also operates connecting buses to the Viking Line pier. See the Flugbussarna Web site for fares and departure times. Taxis are expensive, and they're slower than the train. If you insist on riding by cab, see Arlanda's Taxis page.